Water penetrating foundation walls is a leading cause of property damage. The foundation itself can weaken and crack if continuously exposed to water. And once the water penetrates your foundation, mold and mildew can ruin a basement and whatever is inside. To keep your home dry and mold-free, you need to have your foundation properly waterproofed, ideally before damage happens. My home is new. Do I still need waterproofing? Unless you specifically requested full waterproofing on a new-construction home, its unlikely that your foundation is waterproof. 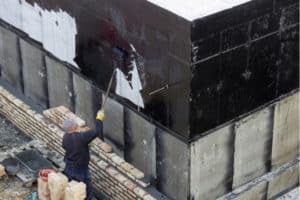 If you are lucky, there might be tar dampproofing, but exterior foundation waterproofing is not standard, even in areas with soggy clay soils and high water tables. Waterproofing tar is the old-school way to keep a basement dry. Years ago most builders didn’t even think about “waterproofing” a foundation. In the last few decades, many builders in wet areas started slapping foundation tar onto poured concrete walls and calling it waterproofing. It’s better than nothing–but not by much. Foundation tar is only good as dampproofing. It’s a tough barrier that makes it harder for moisture in damp soil to seep through your foundation. Once water has pooled up around your foundation, the asphalt is useless against water pressure. It also won’t stop damage from expansive soils, like the clay commonly found across New Jersey and Southeast Pennsylvania. Construction technology has come a long way in the past thirty years. Technologies like carbon fiber and breathable polymer coatings were once limited to research labs and operating rooms. Now, they can be found at the local hardware store. While there are a variety of products that can do the job, it is important that a waterproof foundation uses a membrane which actually forms a seal against water. 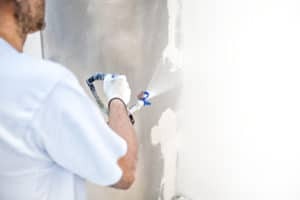 Slapping black goo on your walls won’t do much more than bare concrete or a coat of housepaint to prevent long-term water damage. Best practices for waterproofing a foundation draw on three types of protection to keep your foundation as dry and mold-free as possible. An exterior foundation sealer is applied to block moisture and standing water. 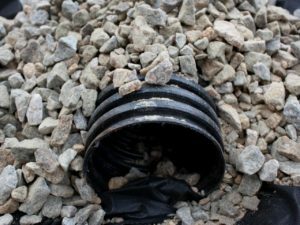 A french drain is installed to carry excess moisture away from the home. The trench for the french drain and vapor barrier is filled with gravel to promote drainage and keep expansive soil away from your home. 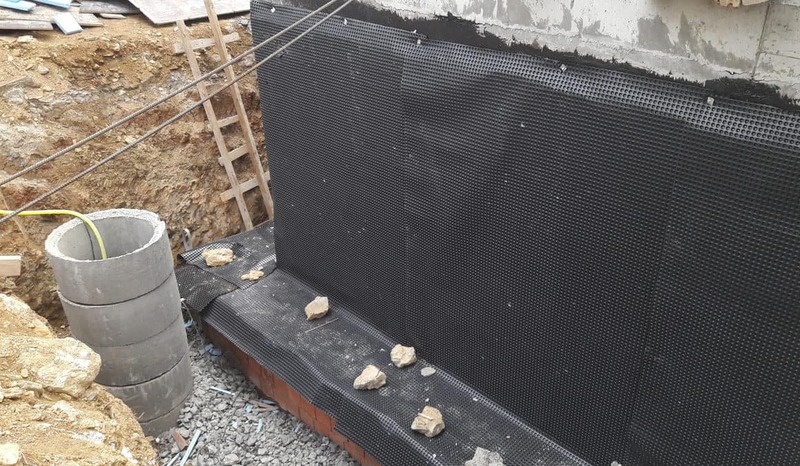 The most important part of a foundation waterproofing project is a barrier that surrounds a basement and prevents groundwater from reaching the porous concrete or cinderblock walls. Contractors have quite a few options to create this barrier. There are several brands of spreadable asphalt coatings which can be used as waterproofing membranes. Unlike older tar coatings, these newer coatings are flexible and won’t crack under water pressure. 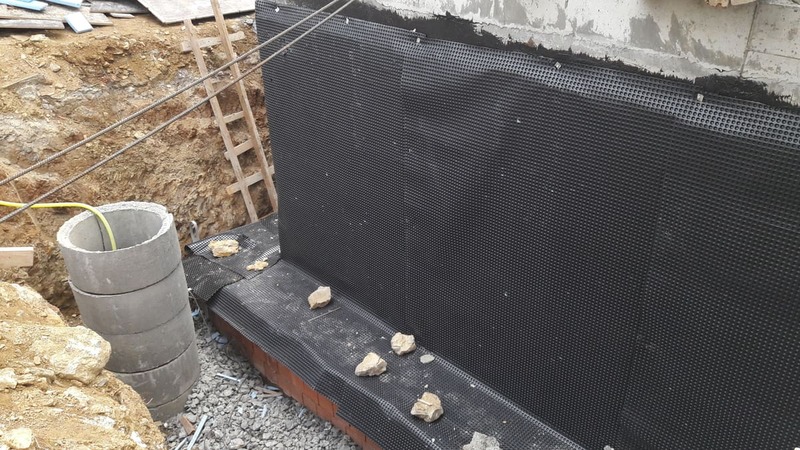 As rubber-based products they are also self-healing, so minor tears or damage from freezing and thawing soils will not compromise the protection of your waterproofing. Several companies offer polymer-based coatings that can be sprayed on with a paint gun. Very similar to the undercoating on a 4×4 truck, these barriers form a gapless seal around your foundation walls. Contractors have to pay special attention to places where pipes penetrate the foundation and any joints or cracks in the poured foundation walls. A contractor will need to totally seal around any pipes or outlets. After spraying the first layer, the contractor should stop and spot-fill any gaps or spots where the coating measures too thin. The gap where a basement floor slab meets the foundation wall should also be filled with a compatible sealant. A cheaper alternative to a spray coating is the application of thick vapor barrier sheets against the foundation walls. These self-adhesive sheets require the foundation to be primed and any large cracks to be filled before they can go up. Once in place, they provide a strong, waterproof barrier between the ground and your wall. After the waterproof coating has been applied, waterproofing best practice is to apply a drainage board in front of it. This board will keep fill soil from resting against your walls, channel moisture to the french drain, and protect the vapor barrier from abrasion and burrowing animals. Some installation will mount this mat to foam insulation sheets before attaching it to the foundation walls. A layer of gravel will be filled in around your drainage mat to protect it from clay soils. A french drain is a sloped trench with a pipe that carries water away from your foundation. Farmers have been using the technique for centuries with clay pipes, but modern french drains use PVC pipes and mesh debris guards to stay clear and effective for years. The french drain will work with a drainage mat to keep water from building up agianst your house. By backfilling the trench with rocks, the waterproofing company creates a sort of natural aquifer that will keep the space around your foundation relatively dry under normal conditions. This is the best way to prevent mold and a cracked foundation because even a perfect waterproof membrane is not meant to act like the hull of a ship all the time. Water might not get through the barrier, but it can still put pressure on the poured concrete and eventually crack the foundation. A full waterproofing project is far beyond the scope of DIY. You need to excavate large sections of earth, precisely apply specialty coatings, and fill the whole project with tons of gravel. It’s important to work with someone you can trust. It’s also important to make sure the contractor is providing quality work. Ask what materials the contractor is using. Think twice about inferior foundation tar coatings–saving a few hundred dollars won’t mean much if your foundation springs a leak six months later. Dry Basement Solutions is a family run company with over 20 years in the industry. To schedule a consultation call 201-258-4540 or visit their website.